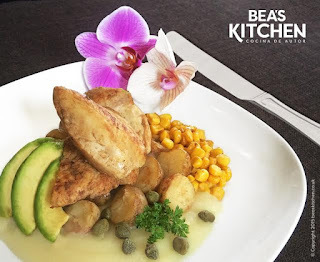 Bea's Kitchen is hosting a fine dining pop-up in Higham's Park, E4, on Thursday 23rd & Friday 24th July 2015. Wth two sittings each night, it's a seven course feast, with Colombian influences, incluidng pumpkin salad, ginger & lemongrass Granité, and confit orange mousse. "Bea’s Kitchen is hosting a fine-dining pop-up over two nights as part of the wider Highams Park Festival of Arts and Culture. For the occasion, Bea who is a Colombian chef has carefully put together her favourite dishes from different parts of the world. Starting with a refreshing amuse bouche, the journey continues to reach its climax at the chef’s own version of the iconic Ajiaco, the typical dish from her home city of Bogotá. There are vegetarian substitutions available which need to be requested at the time of booking. Drinks are available to buy from the bar."